Homemade pasta takes considerable time to make, but you can prepare your own with a few simple ingredients and a little patience. Pasta is also easy to alter according to taste. The trick to forming any type of pasta is in mixing the dough to the proper consistency and cutting it into manageable shapes. This article will provide you with instructions you can follow to prepare a basic pasta, as well as a few variations you can try for something new. Mix the flour and salt. 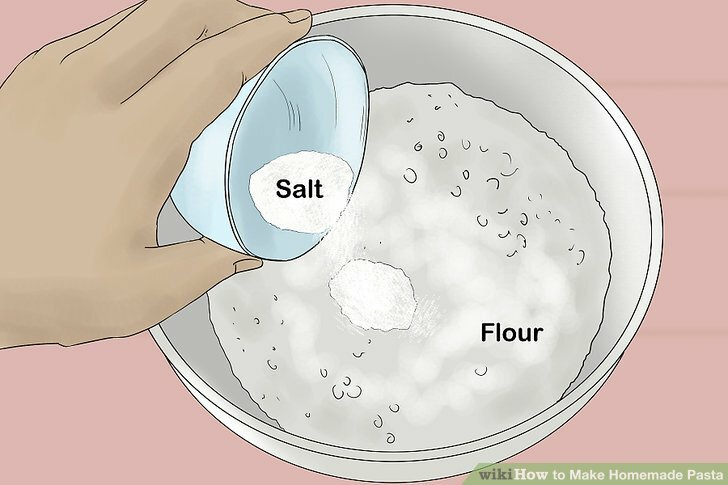 Combine the sifted flour and salt until evenly distributed. If you plan on mixing the dough entirely by hand, combine the flour directly on a well-floured counter. 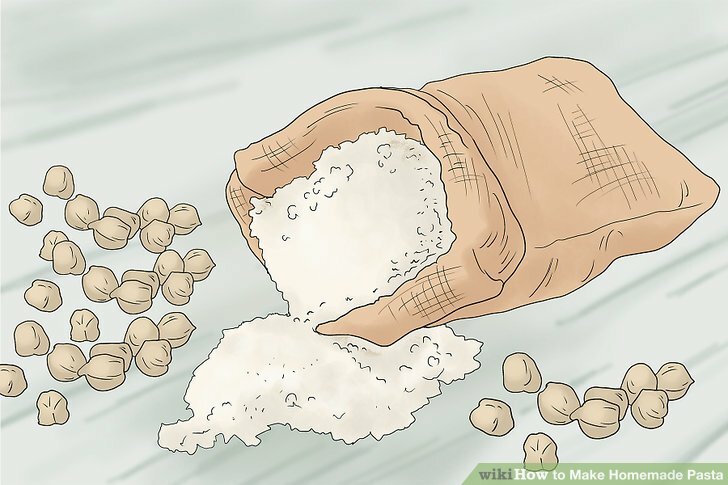 Afterward, use the flour to form a mound with a crater in the top. If you plan to use a stand mixer, combine the flour and salt inside the bowl of the stand mixer. Break the eggs into the flour mound. Add the eggs to the flour, breaking them into the crater at the top of your flour mound on the counter. If using a stand mixer, you can break the eggs into the flour anywhere. Mix until smooth. 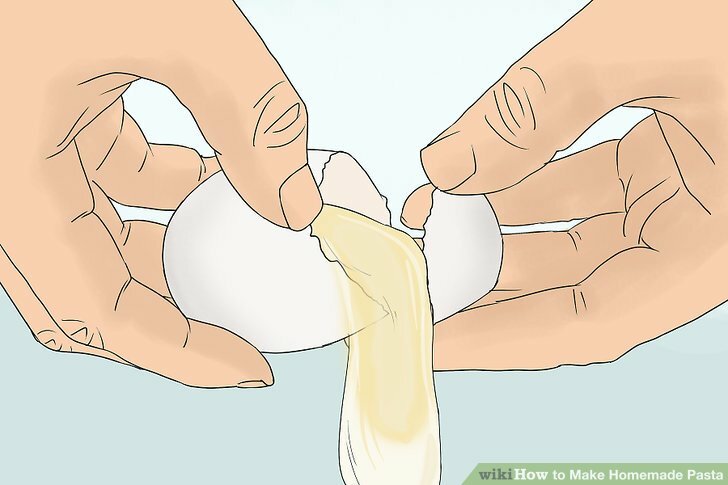 Slowly combine the flour into the eggs using your fingers. Continue mixing in this manner until the dough comes together. If using a stand mixer, combine the ingredients with a paddle or dough hook attachment until the dough comes together. Knead for at least 3 minutes. 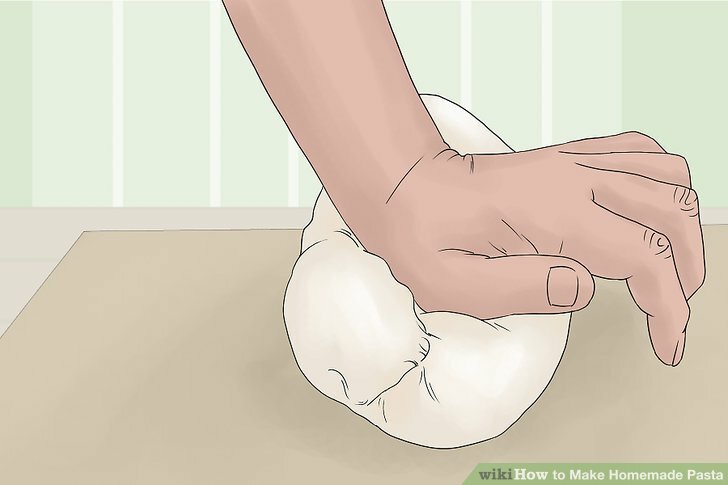 Knead the dough using the heel of your hand until it feels very smooth and no longer feels sticky. If using a stand mixer, turn the dough out on a well-floured counter and knead for 3 minutes. If the dough still feels sticky, knead in an additional sprinkle of flour. Let the dough sit for 1 hour. 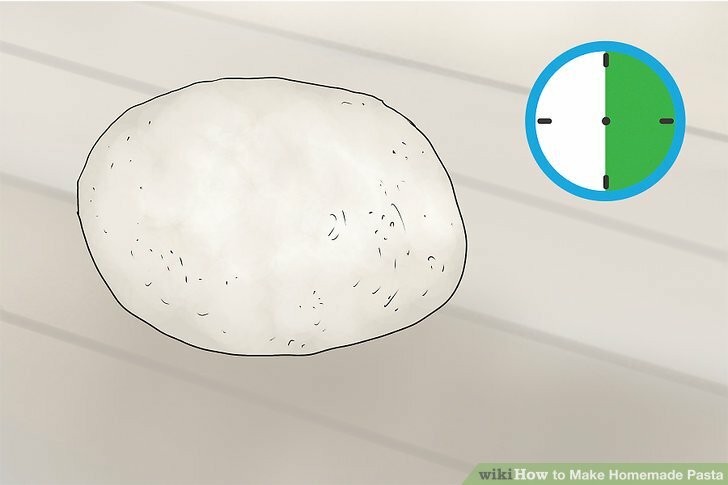 Wrap the dough in wax paper and let it sit at room temperature for at least 1 hour. Note that the dough can sit out at room temperature for several hours. The dough should not be refrigerated. Make spinach dough. Before adding the egg, mix pureed spinach into the flour, creating a green dough. Puree 3/4 cup (180 ml) frozen cooked leaf spinach in a food processor or blender. 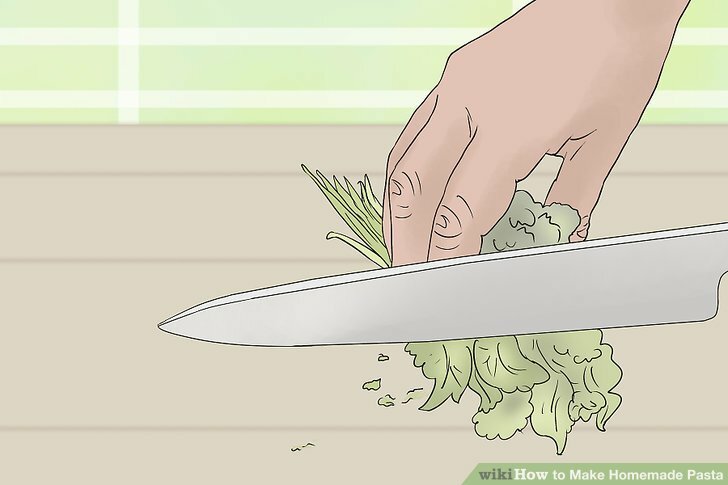 Squeeze the spinach before and after to remove excess moisture. 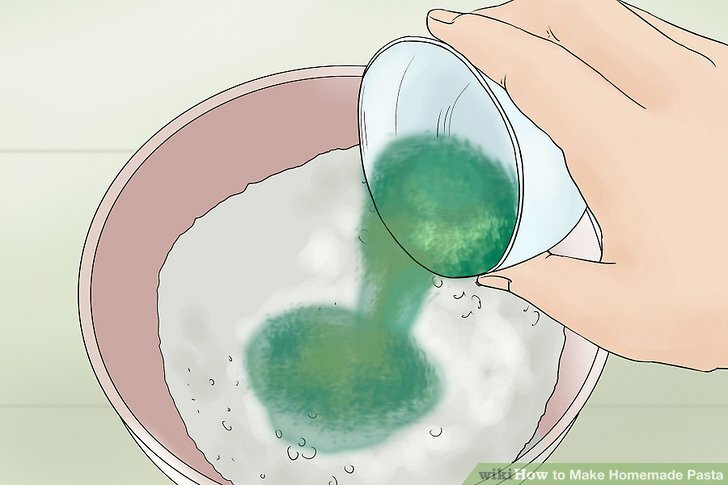 Mix the spinach puree into the flour before proceeding with the basic dough recipe as usual. 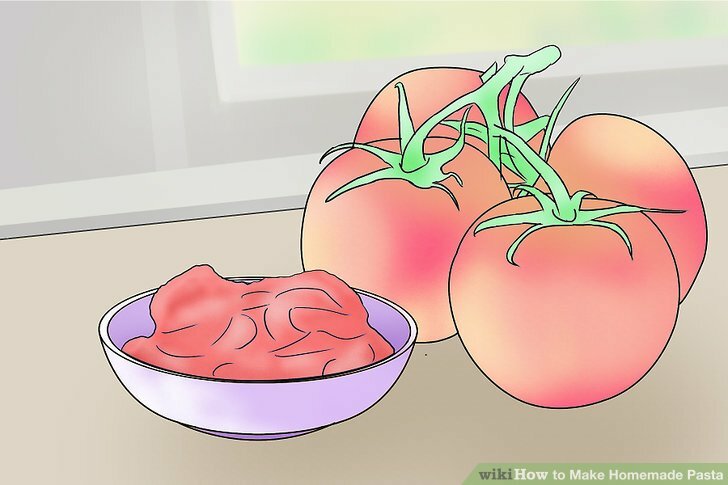 Color the dough with tomato. Tomato paste can be mixed into the flour alongside the egg to create a red pasta. Add 2 Tbsp (30 ml) tomato paste to the flour as you add the eggs. Reduce the number of eggs from four to three. Continue the recipe as usual. Use beets in your basic dough. 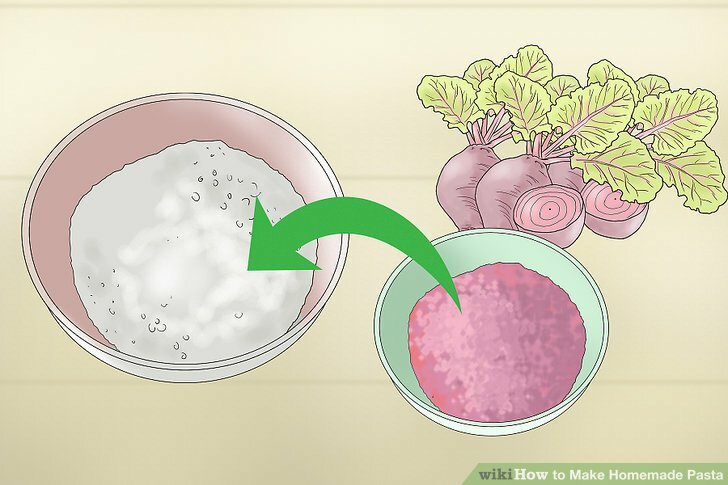 Roasted beets can be mixed into the flour alongside the eggs, but you will need to puree or grate the beets first. Roast the beet in a 400 degree Fahrenheit (205 degree Celsius) oven for 45 to 60 minutes, or until soft. Let sit until cool to the touch. Add 2 Tbsp (30 ml) of the beet to the flour alongside the eggs. Continue preparing the pasta as usual. Make sweet potato pasta. You can add sweet potato paste to the dough alongside the egg, as well. 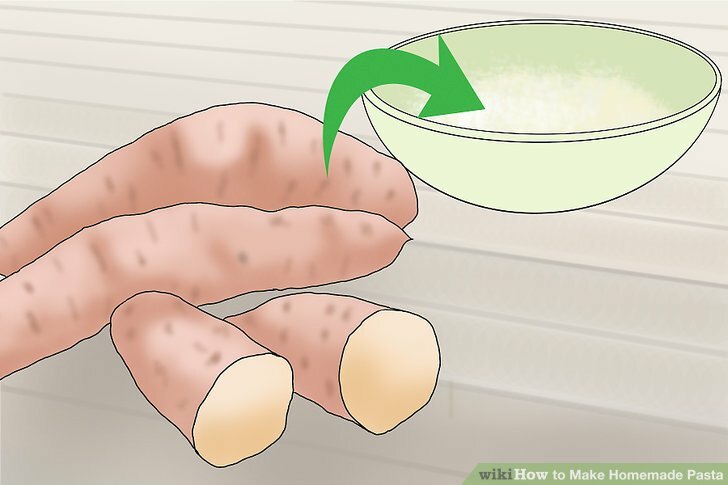 Puncture a medium sweet potato several times with a fork. Microwave the sweet potato on high for 4 to 5 minutes, or until soft. Puree the sweet potato in a food processor or blender. Add 2 Tbsp (30 ml) of the sweet potato paste to the flour when you add the eggs. Prepare the remaining recipe as usual. Prepare a simple herbed pasta. Chopped fresh herbs can be added to the flour with the salt. Use green herbs, like oregano, parsley, and cilantro. You can use a single herb or mix-and-match as desired. Use at least 3 Tbsp (45 ml). More can be added to taste, if desired. Mix the herbs into the flour before adding the eggs. Continue with the rest of the recipe as usual. 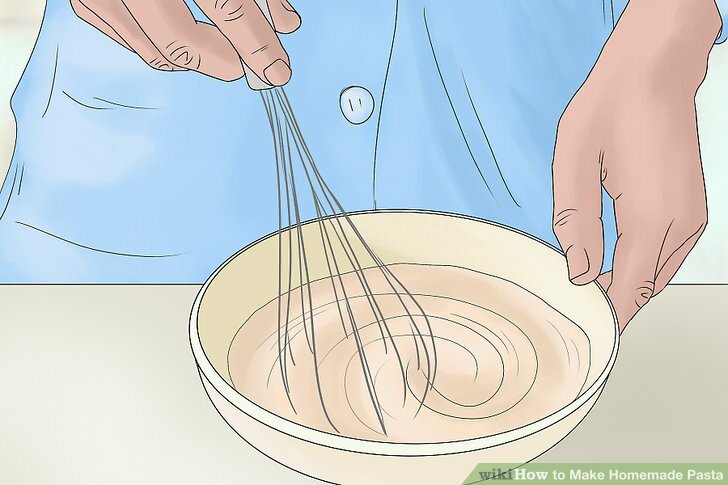 Whisk together the flax seed and water. 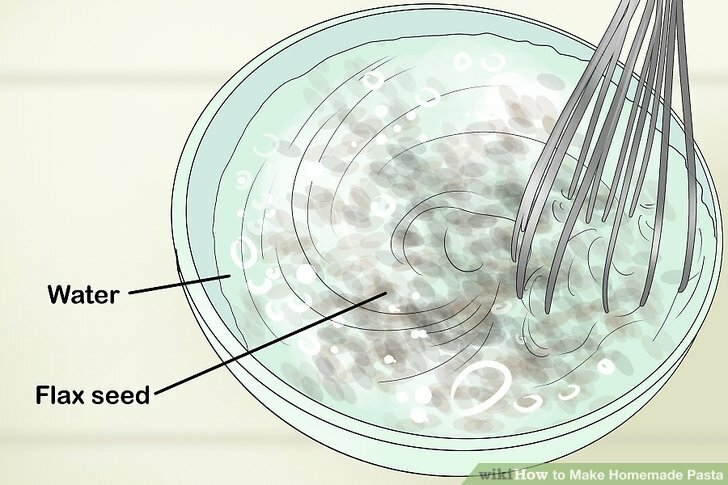 Combine the flax seed and water in a small bowl and set aside for about 5 minutes. The mixture should thicken, turning into a gel consistency. Pile the chickpea flour onto the counter. Create a small indentation or well in the center top of the mound. This dough is a little more fragile than the basic dough, so it is recommended that you mix it by hand instead of using a stand mixer. Combine the flour and flax seed mixture. Spoon the flax seed gel into the flour mound. Gently bring the walls of the flour well in, combining the flour with the flax seed gel evenly. Only mix the dough as long as necessary for it to come together. Let rest for 20 to 30 minutes. Wrap the dough in wax paper or plastic wrap and allow it to rest at room temperature. 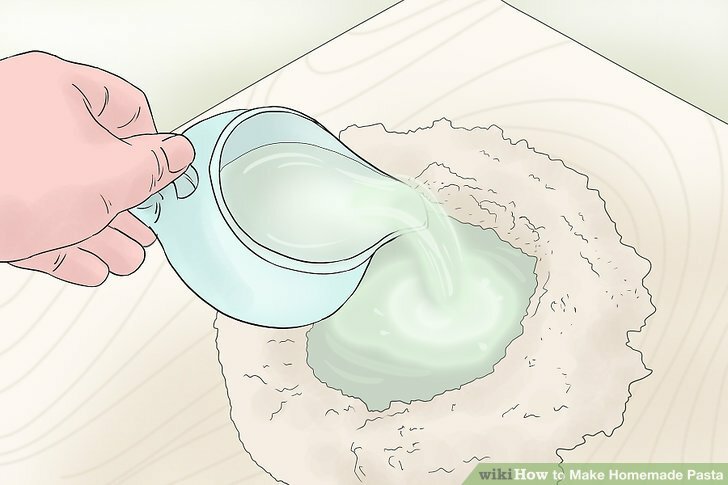 This dough can stay out longer than 30 minutes, but the gel may begin to break down if you leave it out for more than a few hours. Do not refrigerate the dough. Flour the counter. Sprinkle the counter with enough flour to coat it lightly yet evenly. 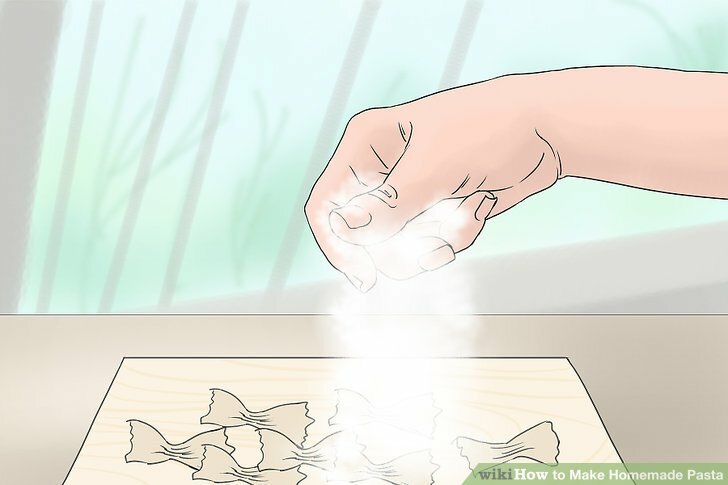 Even though the dough should not be very sticky at this point, as you work with it, the heat from your hands will cause the dough to begin sticking more. Flouring the counter minimizes this effect. Cut the dough into several pieces. 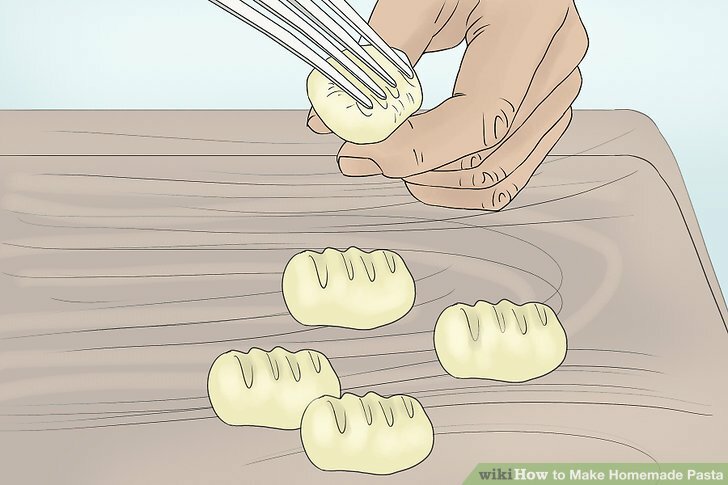 Use a knife to cut the dough into 6 to 8 even pieces. Pass the dough through a pasta machine. The easiest way to flatten pasta dough is with a pasta machine. Flatten each piece of dough one at a time. 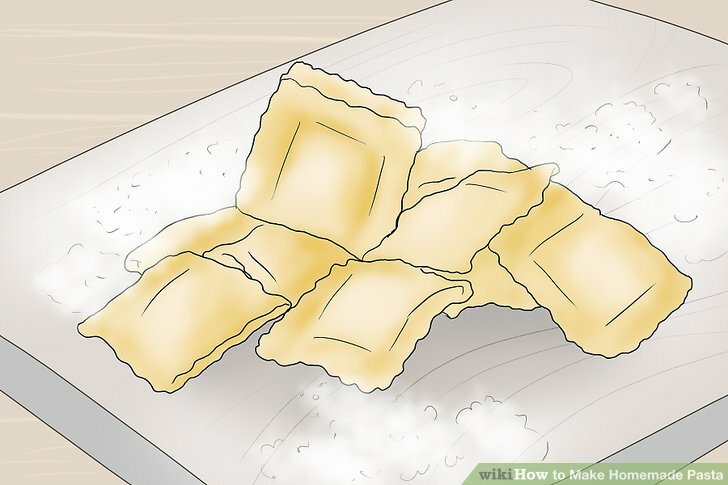 Start by passing through one portion of dough through the pasta machine on the widest setting. Pass the dough through the pasta machine several more times, closing the opening by one notch for each pass. Continue until your pasta is as thin as desired. Repeat with each section of dough. 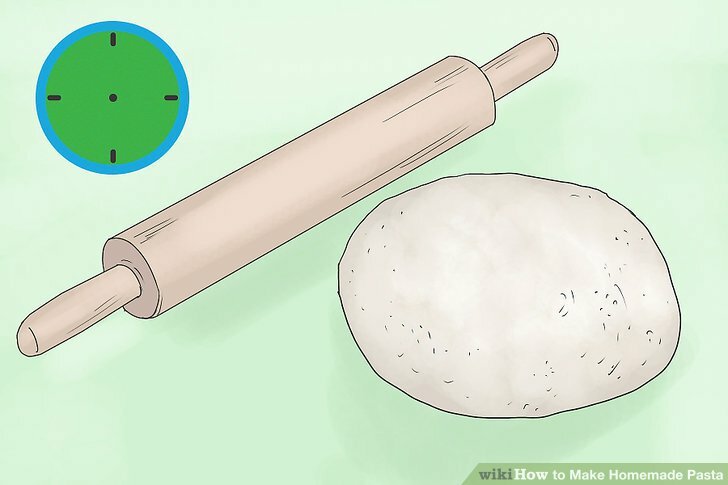 Alternatively, roll the dough flat using a rolling pin. 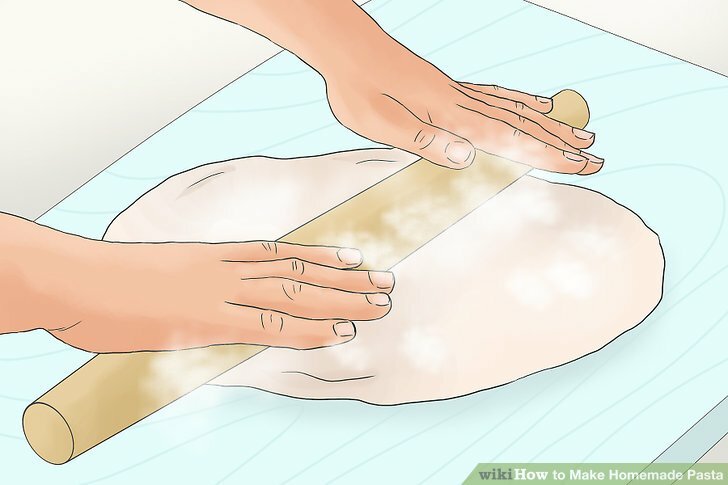 Use a floured rolling pin to roll out each portion of dough as flat as possible. 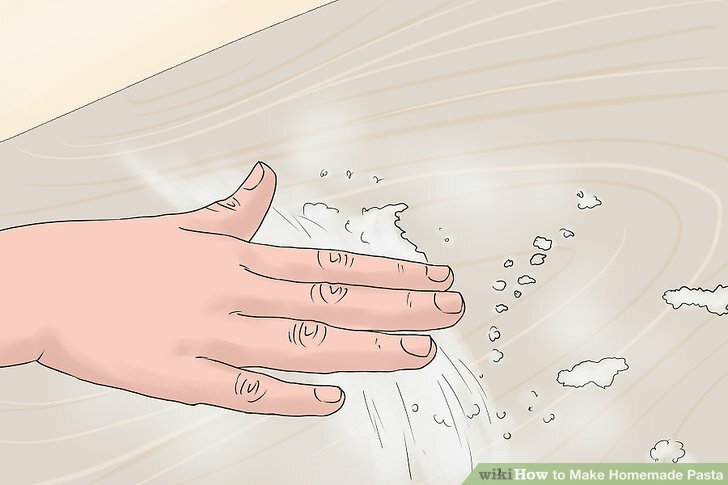 Make sure that both the surface and rolling pin are well-floured. Roll the pasta dough as thin as you think possible. If it is not paper thin at this point, push yourself past your comfort zone and keep rolling until the dough becomes even thinner. Cut the pasta into strips. The simplest way to cut pasta is to cut it into strips. 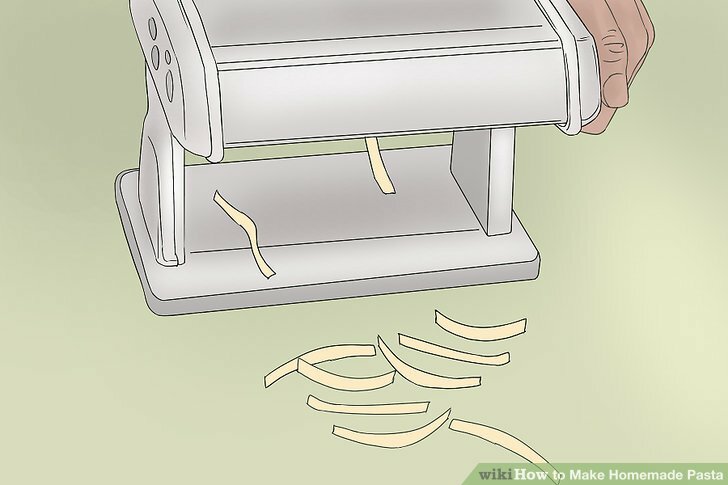 You can use your pasta machine if it has an attachment, but if not, you can cut the pasta easily using a smooth kitchen knife or pizza cutter. Create lasagna noodles by cutting the pasta into 3-inch (7.6-cm) strips. Capellini and fettuccine strips are only about 1 inch (2.5 cm) wide, if not smaller. 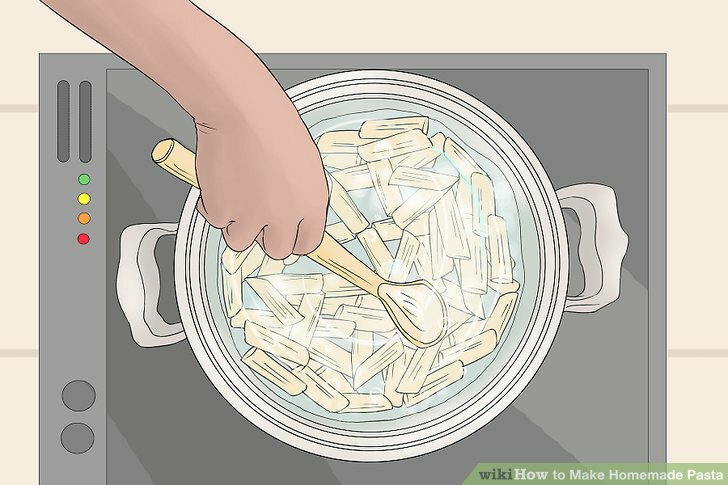 Make garganelli pasta. Garganelli pasta is shaped like small tubes. 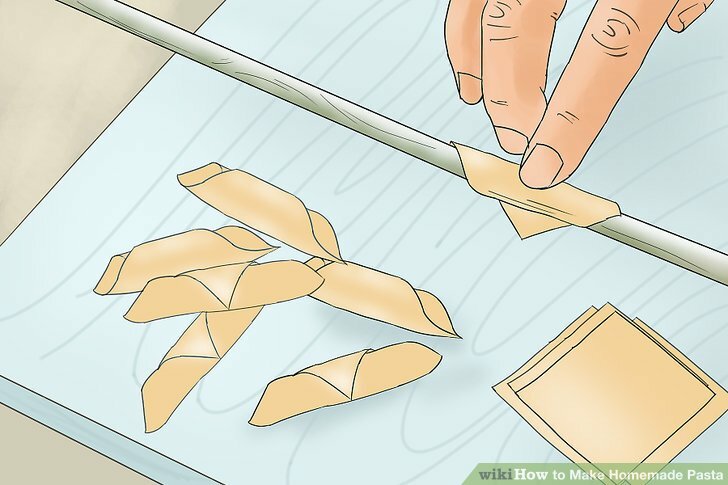 Cut the pasta into 2 to 3 inch (5 to 7.6 cm) squares using a knife or pizza cutter. 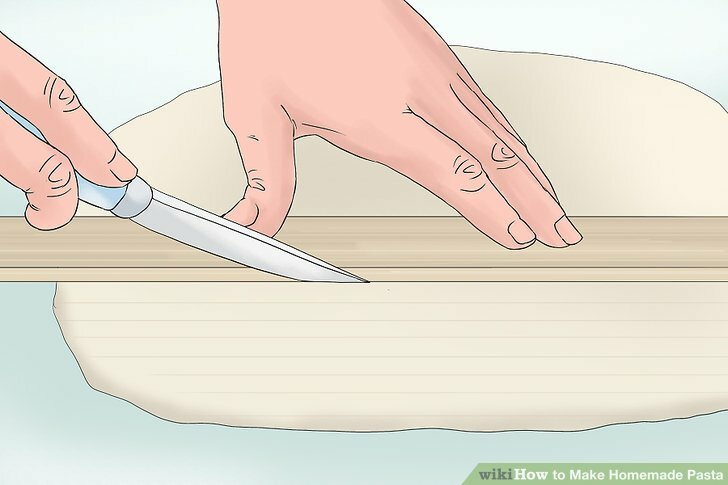 Wrap each square around a clean wooden skewer or chopstick. Press the overlapping corners together to form the tube shape. Form farfalle pasta. 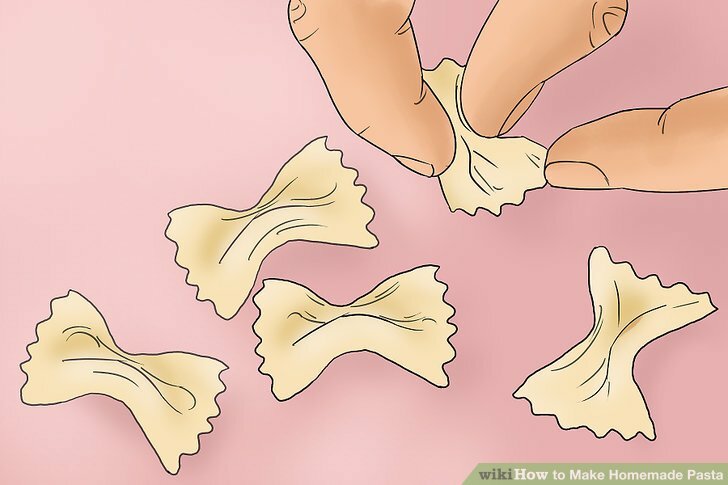 Farfalle pasta is better known as "bow tie" pasta. Cut out rectangles measuring roughly 3 inches (7.6 cm) long and 2 inches (5 cm) wide. Use a knife or pizza cutter. Pinch the rectangles together in the middle. 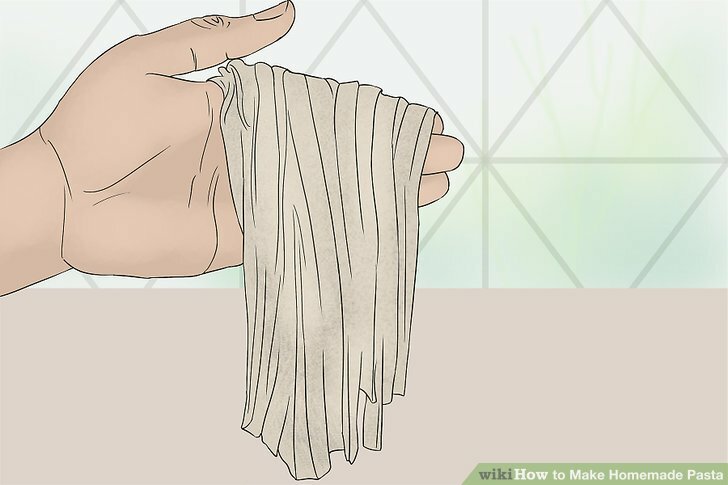 Coat your pasta noodles in flour. 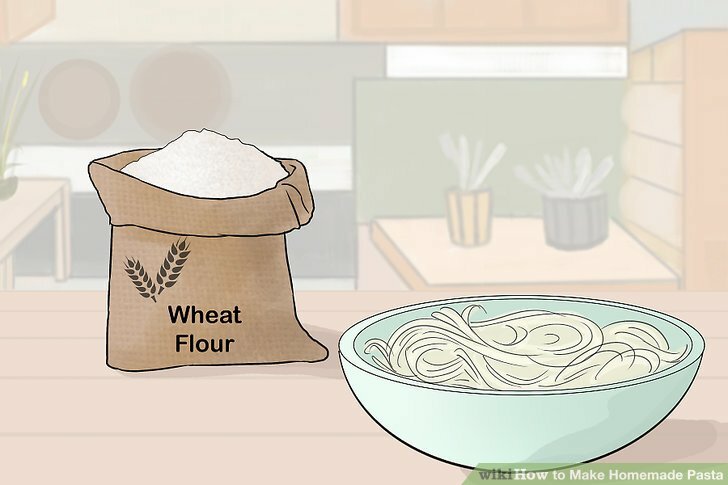 Toss your pasta in flour as soon as you finish forming it. This is especially important if you plan on drying and saving the pasta. Otherwise, the pasta will stick together as it dries. Bring a large saucepan of water to boil. 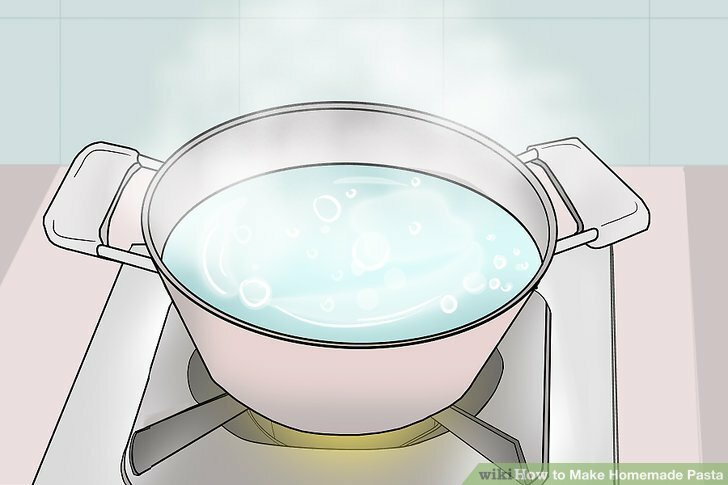 Fill your saucepan with cold water and bring it to a boil over medium-high heat. Add salt to the water to prevent the pasta from sticking as it cooks. Cook the pasta for 2 to 3 minutes. Add your pasta to the water and cook, stirring occasionally. Check for doneness after the first 3 minutes, and continue cooking until done. The pasta will be done once it feels soft but no longer sticky. The vegan pasta will usually be done completely after the first 3 minutes. Note that the length of time needed for the pasta to cook will vary depending on how large the pieces are. Drain. Pour the contents of the saucepan through a colander. Serve cooked pasta with ****er or sauce as desired. 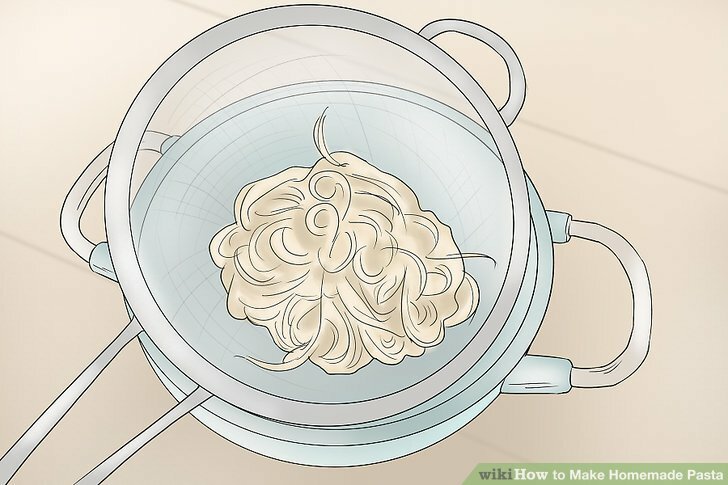 Make noodles from wheat flour. If you're looking for a healthier version of traditional pasta, use whole wheat flour instead of all-purpose flour. Create healthier buckwheat pasta. Buckwheat pasta is a traditional homemade pasta made in the Lombardy region of Italy. Use buckwheat flour to make it. Prepare a batch of egg noodles using your food processor. 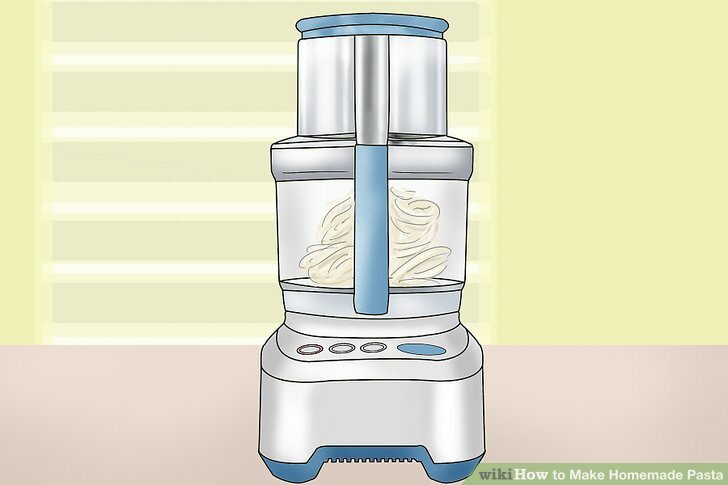 Egg noodles can be prepared using a food processor if you don't have a stand mixer available for use. 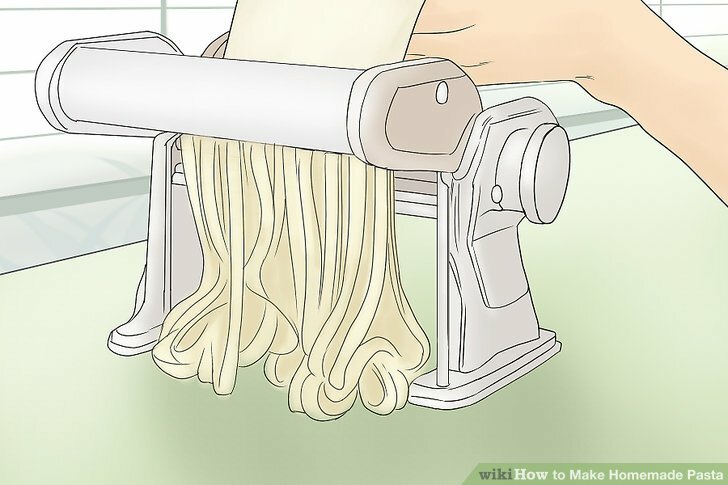 Use your bread machine to prepare pasta dough. 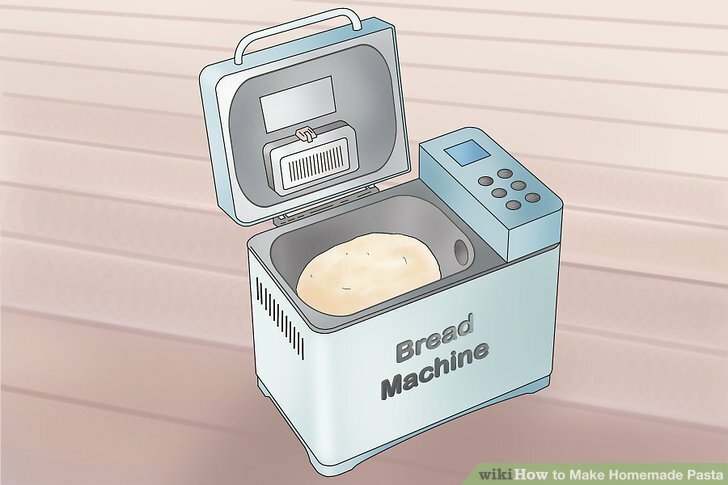 A bread machine can also be used to simplify the process of mixing pasta dough. Try making ravioli. Stuffed pastas are a little more complex than their non-stuffed counterparts, but you can still make your own pasta dough and cheese filling at home without too much difficult. Make macaroni pasta. Macaroni pasta can be tricky to form, but the concept is fairly simple. 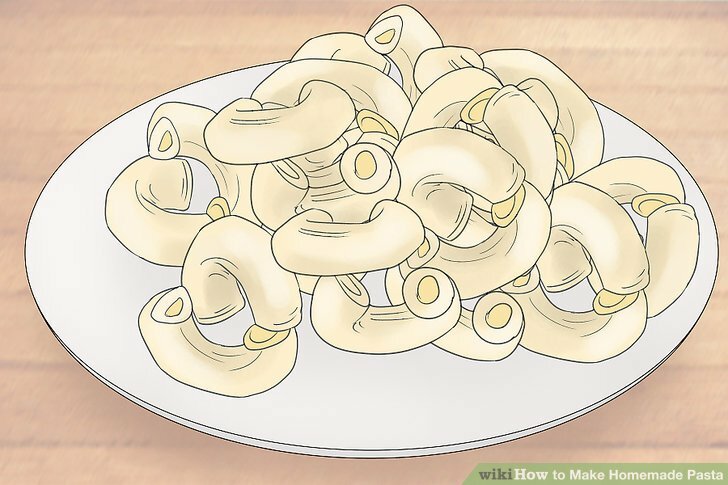 Form tubes of pasta dough and bend the tubes slightly to give them the trademark macaroni shape. Prepare large batches of Yi min noodles. These noodles are made from wheat flour and tend to be fairly chewy once cooked. The pasta can be somewhat tricky to work with, but once you learn how to make these noodles, you can make large batches with ease. Try making gnocchi. Gnocchi are a cross between pasta and dumplings. These tiny bits of pasta are made with potatoes, eggs, and flour.